The Brain Geek: What's a neuron? Neurons are the basic building blocks of the brain, and in future posts I’ll be referring to them over and over again. Neurons control almost everything you do. There’s 86 billion of them in your brain alone. That’s more than 12 times the number of people on the entire planet. If you took all the neurons in the brain at stretched them out, you’d get a line 860 kilometers long, or about 534 miles. That’s longer than the distance from San Francisco, California to Tijuana, Mexico, and would take about 10 hours to drive in a car. But because neurons are so small that you can only see them through a microscope, the line would be invisible! There’s even more neurons running through your body, controlling your heart rate and breathing and digestion and every little movement your muscles make. They help you see and smell and hear and they know when you’re hungry and thirsty. When you think, there’s an electrical storm in your brain as millions of neurons share pictures and words and feelings. Your neurons are, quite simply, you. A neuron. The neurons in the visual, motor, memory and language centers of my brain, as well as in my eyes and muscles, all had to talk to each other so that I could draw this picture. 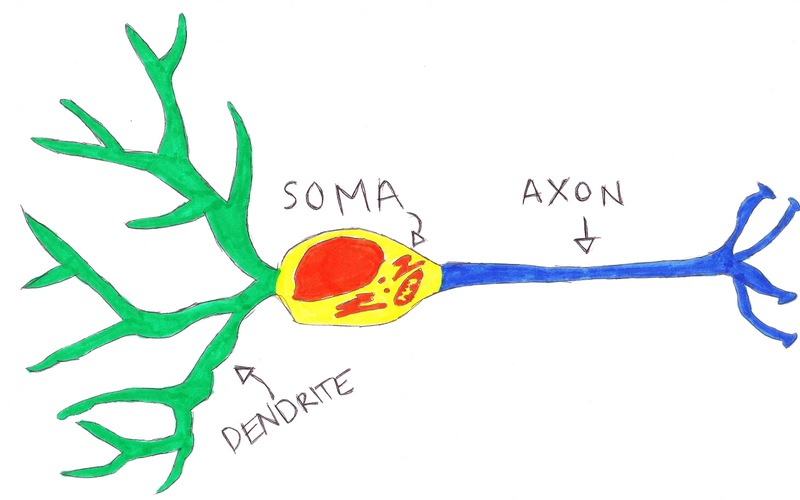 The soma is the neuron’s control center. It keeps the neuron healthy, produces all the proteins and chemicals that a neuron needs to function, and holds the neuron’s DNA. When one neuron has an important message to send (like, “Ow-wow! Get your hand off that hot plate!”), it sends the message as an electrical signal down its axon. This message is called an action potential. The dendrite of the next neuron in line (I’ll call it neuron #2) picks up the signal and sends it to its soma. If the signal is strong enough, it triggers a new action potential in neuron #2’s axon, which signals to the dendrite of neuron #3, and so on until you pull your hand off the hot plate. That’s Neurons 101. Coming up are how the action potential works, what’s a synapse, and more about how your muscles respond to that hot plate.